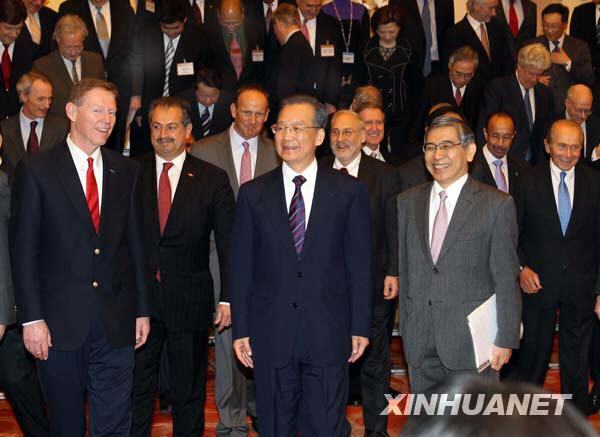 On the afternoon of March 22, 2010, Premier Wen Jiabao of the State Council met in the Great Hall of the People with the overseas delegates attending the 2010 annual meeting of China Development Forum. The two sides held an in-depth conversation on such issues as the world economic situation, especially China's continuous efforts of coping with the international financial crisis, maintaining stable and relatively fast economic growth, speeding up the transformation of economic development mode and promoting international economic and financial cooperation. At the beginning of the meeting, Wen said that "I have met with the overseas delegates attending China Development Forum for eight years in a row. Thank you for paying close attention to China's reform, opening up and development. You traveled thousands of miles to China just because you have confidence in this country. China will make you to strengthen such confidence with its own actions and performance. The meeting today is different from the past in two ways: first, the ministers of several key departments of the State Council are present; second, our conservation is completely open to the journalists. I hope you say all you know and say it without reserve". HSBC Group Chairman Stephen Green asked the first question about the Chinese government's consideration on building a sound financial system and developing the capital market. Wen said one important reason that China can better respond to the international financial crisis is that its financial system is relatively healthy and hence is not impacted heavily. But China's financial system is not without problems. It is only because the Chinese banks did not have the highly leveraged investment-related risks. In facts, Europe and the US are more experienced than us in banking regulation. After all, you have a history of more than 100 years while we only have over 20 years. When I first visited the Bank of England, my biggest impression is that it has many doors and small windows. I didn't expect the European banking sector is also involved in the international financial crisis. He noted that we will build a comprehensive, healthy and sustainable financial system through reform. We implemented a moderately loose monetary policy last year in order to maintain sufficient liquidity and balance and sustainability of loans, but our expectations were not fully fulfilled. It shows that we still have problems of financial regulation and supervision. Some people who don't know the truth think that the Chinese government expands the credit scale purposely. Actually this is what I'm worried about everyday. On the Summer Davos Forum last year, I made it clear we should well manage the inflation expectations and credit management was strengthened consequently. However, easy loans reoccurred in January this year, indicating the existence of system problems. Therefore, China cannot stop its financial reform and should instead continue to deepen it. The financial crisis has not ended yet, and the most impressing task for us at present is to prevent systemic risks. He said that China attaches importance to developing the capital market. We did not relax the reform of capital market even in the most difficult times. Last year China launched the second board. The goal of reform is to change from the dominance of indirect financing to the combination of indirect and direct financing and give full play to the role of capital market. Chair of the Board and CEO of DuPont Ellen Kullman asked the question on how the Chinese government is going to use the advanced technologies including biotechnology to promote its future sustainable economic growth. Wen said that we welcome multinational companies to invest in China. The real economy in China is most heavily impacted by the financial crisis. However, some companies have survived the difficulties and developed further thanks to their technological strength and talented employees. Multinational companies play the major role in coping with the economic crisis and recovering the world economy. Reviewing the past, the several major world economic crises were usually followed by major technological changes. It is precisely technological revolution that drives technological breakthroughs, helps overcome economic crisis and fuels economic development. Our hope for the future of Chinese economy relies on scientific and technological progress, especially the new and high technologies including biotechnology and life sciences. There is no boundary to the development of biotechnology and life sciences which are closely linked with human survival and indispensable to people's daily life. China has a large population, and biotechnology and life sciences enjoy great development and market potential here. China is willing to strengthen cooperation with companies all over world which have advanced technologies. The Chinese government will create opportunities for you and also ask you not to loose those opportunities, said Wen. London School of Economics and Political Science professor Nicholas Stern asked whether China sets higher targets of energy efficiency and emission reduction in the "twelfth five-year" plan. Wen said that the issue of greenhouse gas emission is mainly the result of industrialization of developed countries over more than 100 years. A developing country like China does not have many cumulative emissions or per capita emissions. As a responsible developing country, we sincerely raise our own targets of emission reduction. China will never follow the old path of developed countries of pollution first and treatment second. Energy efficiency and emission reduction, as a major strategic policy, runs throughout the "eleventh five-year" and the "twelfth five-year" plans and future development process as well. In the "eleventh five-year" plan, our target is to cut the energy consumption per unit of GDP by 20% within five years. We have paid a heavy cost for this target. We have reduced iron & steel output capacity by nearly 100 million tons, small thermal power capacity by 60 million KW and cement capacity as well over the past four years, which has posed serious pressure on employment. We insist on the principle of "common but differentiated responsibilities". Our emission reduction target is independently set and binding. It is approved by the National People's Congress and subject to evaluation. At the Copenhagen Climate Conference, on behalf of the Chinese government, I solemnly announced the target of reducing China's carbon emission intensity by 40-45% in 2020. We will integrate this target into our "twelfth five-year" plan. China's target of emission reduction is not attached to any conditions and we will strive to do even better. When answering the question of C.V. Starr & Company Chairman Maurice Greenberg on how to handle the differences of big powers in tackling the financial crisis, Wen said that we need to pull together and help each other in front of the financial crisis. At the beginning of the crisis, I appealed to people to build confidence and courage. Now I want to stress that people need to remain calm and sober. The world economy has shown signs of recovery, but the road to recovery is by no means a smooth sailing. I appeal once again to all the responsible countries and all the entrepreneurs with conscience not to fight trade war or currency war because it is not helpful for us to overcome difficulties. What we need now is mutual respect, equal consultations and closer cooperation. China can make three promises. First, handle our own affairs well and do not cause trouble to the world; second, do not beggar our neighbor; third, work with other countries to advance the reform of international financial system, reinforce policy coordination, handle the crisis together and ensure more stable recovery. Morgan Stanley Asia Chairman Stephen Roach said there are wide consensuses on two issues. First, countries should avoid falling into the trap of trade frictions and protectionism; second, China should accelerate the change of economic development mode. What is your opinion on the two issues? Wen said that like many countries in the world China advocates free trade. Only with free trade can we maintain economic dynamism, world harmony and diversity of life. I'd like to take this opportunity to convey a message to the international community that China never seeks trade surplus and on the contrary will try its best to expand imports. It is the direction of our long-term efforts to keep the basic balance of international payments. China's economic growth last year was mainly driven by domestic demand. Our trade surplus is decreasing steadily and we have already had trade deficit in early March this year. As early as before the international financial crisis, I have pointed out the Chinese economy has uncoordinated, unbalanced and unsustainable problems, said Wen. Although in general China has performed relatively well in the fight against the crisis, many problems have been exposed. This crisis is in fact a challenge to China's economic development mode. I used "urgent" to describe our task of changing economic growth mode in the Government Work Report. The change of development mode should cover the following aspects: stick to the expansion of domestic demand as a long-term strategic policy without wavering; narrow down the urban-rural gaps and regional disparities and expand household consumption; speed up the development of service industry, focus on the development of emerging sectors of the secondary industry, seek stable development of the first industry and consolidate the foundation role of agriculture. Wen said that to change the development mode is a long-term and arduous task. The 2 million unemployed citizens make the US government very upset, but China faces the unemployment pressure of 200 million instead of 2 million. There exist big gaps between rural and urban areas of China. Yesterday I just visited China's southwestern arid area in Yunnan and still saw the picture of "a yoke of two cattle for tilling" there. This will influence China's sustainable development. We will give priority to changing the development mode when formulating the "twelfth five-year" plan. US-China Business Council Chairman Andrew Liveris asked about Wen's views on the upcoming second China-US strategic and economic dialogue in May. Wen said that China-US relationship is very important. It not only is linked with the fundamental interest of the Chinese and the US people but also to some extend goes beyond the boundary of the two nations. The bilateral economic and trade relations are a major part of bilateral relationship. Although China and the US have some problems and conflicts, solutions can surely be found on the precondition of equal consultations, mutual benefit and reciprocity. The China-US strategic and economic dialogue in May is a very important event and poses a key opportunity for the two sides to solve conflicts and problems. We attach great importance to it. There is a saying in China that where hills bend, streams wind and the pathway seems to end and past dark willows and flowers in bloom lies another village. Recalling the past, the problems and conflicts between China and the US have been solved one by one and the political and economic relations between our two countries will get closer, which makes the two peoples full of confidence in the bilateral relations. You serve as the bridge of friendship between China and the US. I want to send this information through you to the US business community that we welcome American companies to invest in China and China will import more American products. In response to the question of Asian Development Bank President Haruhiko Kuroda on how to strengthen China's social security system and gradually increase the proportion of residents' income to national income, Wen said that we will make greater efforts to improve social equality and build a comprehensive social security system. China has more than 40 million of population living in absolute poverty and 270 million of low-income population. A comprehensive social security system is especially meaningful for the disadvantaged groups. So far we have initially built the framework of social security system. Pension plan has been widely implemented in cities and we will carry out pilot pension plans in 23% of the rural area this year. Pension plan for farmers is a historic change. Health insurance, although the level is still relatively low, has covered 1.24 billion of population. The new rural cooperative medical system enables farmers to afford hospital services. We have also especially established the social security fund. We have realized free compulsory education in a real sense. Recently, we have implemented the policy of tuition exemption for rural poor students of secondary vocational schools and increased the grants by 10 folds. He noted that there are three levels of increasing residents' income: first, gradually increase the proportion of residents' income to the entire national income; second, gradually increase the proportion of workers' salary income to factor income; third, use financial and tax leverage to narrow down income gap and promote social security in the secondary distribution. All of those efforts are still in the initial stage and not perfect yet, but we will continue our efforts relentlessly. China Development Forum President of the foreign side Alan Mulally expressed confidence in China's future development and expectation to continue to play a role for China's growth. I have mentioned that more opportunities will be created in the future to contact entrepreneurs of different countries. Today is not the first one and surely not the last one. You are always welcomed to China, said Wen. More than 60 overseas delegates including senior officials of international organizations, senior executives of leading multinational companies and well-known international scholars attended the meeting which lasted over 100 minutes. Wen took group photos with the overseas delegates prior to the meeting and shook hands with them after the meeting.